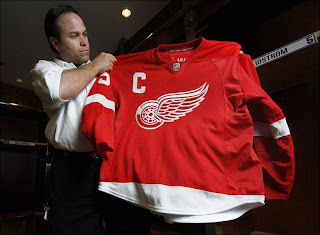 A reader emailed me a link to this article from the Detroit Free Press regarding the Red Wings new uniforms today. Apparently, today the Wings officially unveiled the jerseys to the public (despite having posted images of it online last week). Traditionally, the captain's "C" is worn on the player's left shoulder — this is true across the league. But apparently, because the tip of the wing logo reaches too high, the "C" would have collided with the confluence of three different types of material. 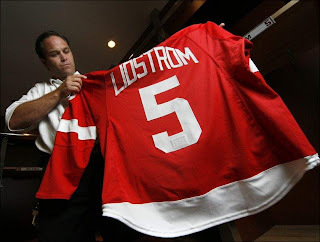 So to avoid that problem, Niklas Lidstrom's "C" will swap sides starting this year. Here you see equipment manager Paul Boyer showing off the new threads. Not too shabby, if you ask me. Naturally, this will affect Detroit's alternate captains as well. Just like the "C," the "A" will also go on the right shoulder now. What do you guys think of the new location? Does it really make a difference?